– total 4 weeks, 5.5 days each week, 3.5 hours practice and 4 hours lectures everyday, 6 group healing sessions. – total 20 Participants: 5 people age 40-49; 5 people age 50-59; 4 people age 60-69; 3 people age 70-79; 1 person age 80-89; 2 people age 10-20. – all 20 participants experienced improvements: 7 of them experienced great healing on one or more issues; 5 of them saw big improvements; 8 of them had good benefits and results. Anita was diagnosed with different tumors in twelve different parts of her body a while ago. Western medicine treatment like Chemotherapy brought her so much pain and sufferings, so she decided to seek for alternative treatment. 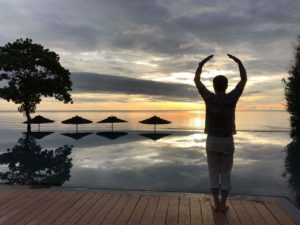 she found ZN Qigong at a local Qigong workshop in Europe in October 2017. And then she went to one month healing retreat in Dali China in December 2017. And then she came to Vancouver healing retreat for another one month. I was having an office visit with my Lyme doctor earlier this week. This is only a few weeks after the retreat in Vancouver. She said in terms of the Lyme, I am doing incredibly well. We were speaking about how long I had been working with her (almost ten years). I began seeing her after I was diagnosed with Lyme disease. She was recalling to me when I had seriously began to practice Qigong, and the changes she saw in me. It was about a year into my treatments. Her comment then was “What are you doing? Your level of healing is far greater than anything I can offer you.” She told me this week what she experienced at that time was a change in the structure of my whole energy system. She thinks of this change often while she treats other patients. I have and continue to experience health benefits from my practice. Some of the specific changes I experienced over these past 9 years were surprising. Shortly after my first retreat and home practice for about 3 hours a day, I was told by a body worker who had worked with for some time before I began to practice, was that the scoliosis in my spine had corrected. As I love gardening and live in the Pacific Northwest, I would frequently experience chilblains in my fingers and toes from poor circulation. These symptoms went away as well as decreased pain in my lower back. Something else also unexpected was the emotional changes: feeling happier, less reactive to difficult situations, and more self confident. All of these changes lead me to want to share this beneficial practice with others. I trained to become a teacher with Master Mingtong Gu at the Chi Center in New Mexico. 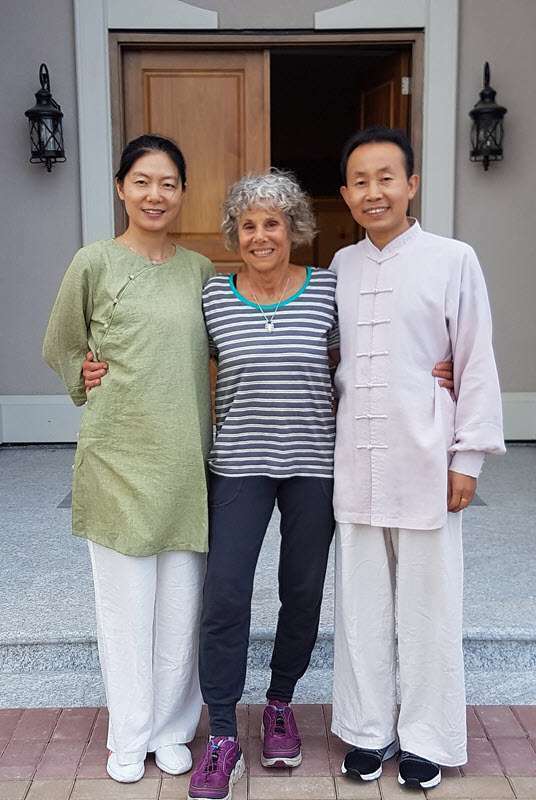 During this past retreat I received much benefit from Teacher Lu and Teacher Ling’s teachings. I deeply understood the importance of the mind/body/heart being in a chi state: emptying my mind, allowing stillness and space, as well as relaxing my heart and entire body. I experience how being in this state while I practiced allowed me to connect with the Qi at deeper and more subtle levels. I find this particularly powerful when I am feeling fatigue. Since this has be an issue for me long before I contracted Lyme, I see how I can actually move my body and end up more energized than lying down and resting. The emphasis on the mind leading the movement with attention in my body, has allowed me to feel the mind more concentrated, focused and calmer. During the weekend visit at my daughter’s home in between the two weeks of the Vancouver retreat, we were walking up and down very steeps hills. She offered, unsolicited, that she had never seen me stronger. It does feel to me that I have a deeper core strength, my whole body feel infused with fresh energy. I believe these benefits come as a consequence of Teacher Lu and Teacher Ling’s teaching as well as gaining a greater confidence in the healing possibilities of this practice. Added to my experience the warmth, support, and fun from the teachers and all the participants, this indeed is an healing experience I would recommend.